Electrical motors have been developed in various special types, such as stepper motors, servo motors, permanent magnet motors etc. We have a lot of choices to choose a motor that is most suitable for our application. A Brushless DC motor or BLDC motor is the type which is most suitable for applications that require high reliability, high efficiency, more torque per weight etc. Commutator helps in achieving unidirectional torque in a typical dc motor. 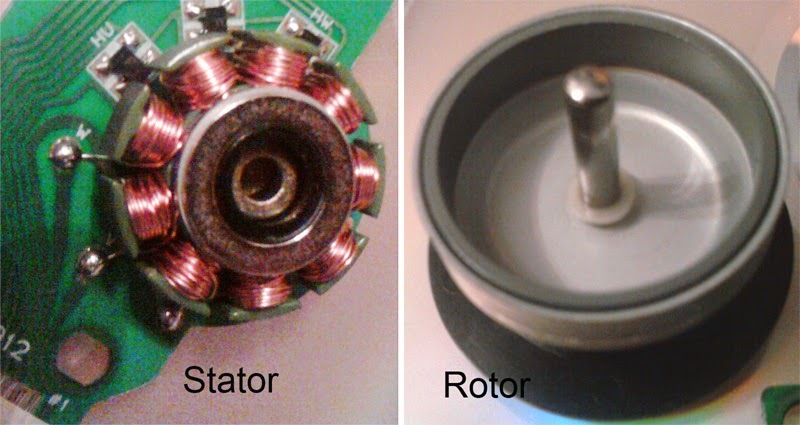 Obviously, commutator and brush arrangement is eliminated in a brushless dc motor. And an integrated inverter / switching circuit is used to achieve unidirectional torque. That is why these motors are, sometimes, also referred as 'electronically commutated motors'. Just like any other electric motor, a BLDC motor also has a stator and a rotor. Permanent magnets are mounted on the rotor of a BLDC motor, and stator is wound with specific number of poles. This is the basic constructional difference between a brushless motor and a typical dc motor. There can be two types of BLDC motor on the basis of construction : (i) inner rotor design & (ii) outer rotor design. The following image shows an example of outer rotor BLDC motor. Brushes require frequent replacement due to mechanical wear, hence, a brushed DC motor requires periodic maintenance. Also, as brushes transfer current to the commutator, sparking occurs. Brushes limit the maximum speed and number of poles the armature can have. These all drawbacks are removed in a brushless DC motor. Electronic control circuit is required in a brushless DC motor for switching stator magnets to keep the motor running. This makes a BLDC motor potentially less rugged. Advantages of BLDC motor over brushed motors are: increased efficiency, reliability, longer lifetime, no sparking and less noise, more torque per weight etc.